Anyone who has bought an iPhone or another Apple product has seen the note on the company’s packaging that its products are designed in California, but that doesn't mean they're manufactured there. 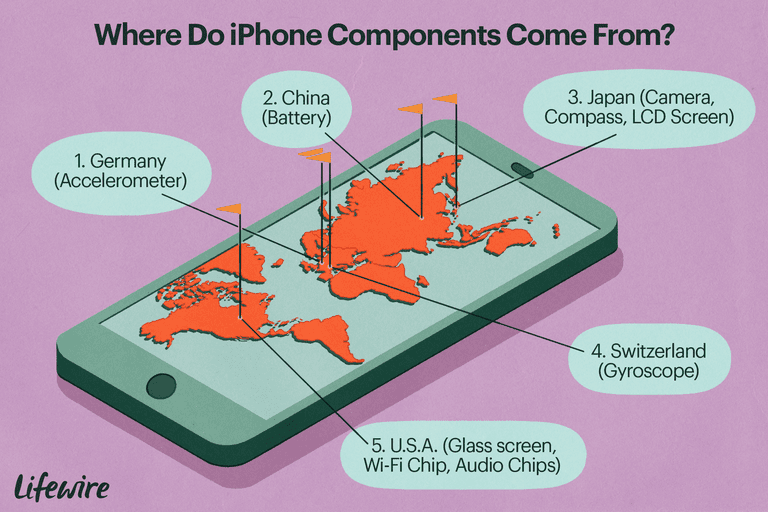 Answering the question of where the iPhone is made isn't simple. When trying to understand where Apple manufactures its devices, there are two key concepts that sound similar but are different: assembling and manufacturing. Manufacturing is the process of making the components that go into the iPhone. While Apple designs and sells the iPhone, it doesn't manufacture its components. Instead, Apple uses manufacturers from around the world to deliver individual parts. The manufacturers specialize in particular items—camera specialists manufacture the lens and camera assembly, screen specialists build the display, and so on. Assembling, on the other hand, is the process of taking all the individual components built by specialist manufacturers and combining them into a finished, working iPhone. The components manufactured by those companies all around the world are ultimately sent to just two companies to assemble into iPods, iPhones, and iPads. Those companies are Foxconn and Pegatron, both of which are based in Taiwan. Technically, Foxconn is the company’s trade name; the firm’s official name is Hon Hai Precision Industry Co. Ltd. Foxconn is Apple's longest running partner in building these devices. It currently assembles the majority of Apple's iPhones in its Shenzen, China, location, although Foxconn maintains factories in countries across the world, including Thailand, Malaysia, the Czech Republic, South Korea, Singapore, and the Philippines. Pegatron is a relatively recent addition to the iPhone assembly process. It is estimated that it built about 30 percent of the iPhone 6 orders in its Chinese plants. As you can see, the answer to the question of where the iPhone is made isn't simple. It can boil down to China since that's where all the components are assembled, and the final, working devices come from, but it's a complex, nuanced worldwide effort to manufacture all the parts that go into making an iPhone.